Specialist townhouse broker, Leslie J. Garfield is delighted to launch the sale of 85 Perry Street, a newly listed, 2,850 sq. 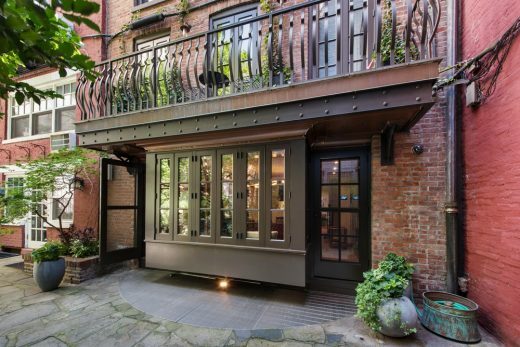 ft. four bedroom townhouse in the heart of Greenwich Village. 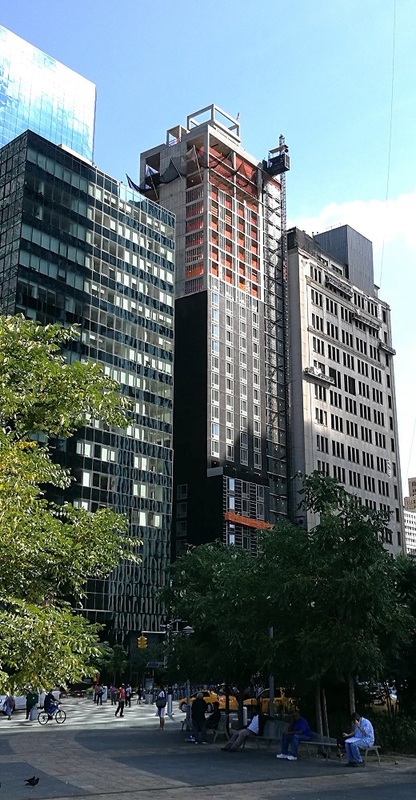 Construction is now 24 stories above street level on the 33-story tower designed by architects Woods Bagot. 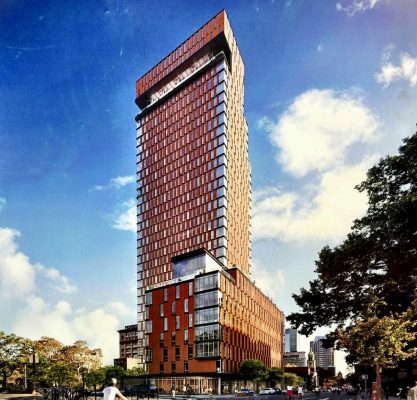 The 270-unit mixed-use building at 120 Nassau Street, located on the corner of Jay Street in Downtown Brooklyn, report yimby.com. 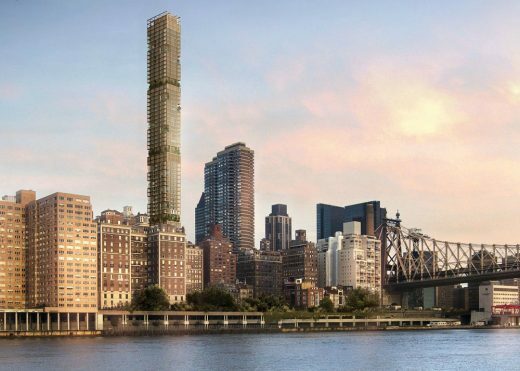 The latest building permits indicate the 425-foot-tall tower will measure 312,093 sqft. The base will include 57,904 square feet of commercial space, in the form of retail on the ground floor and office space on floors two through eight. The residential units elsewhere in the tower should average 854 square feet apiece, indicative of rentals. The Clarett Group is the developer. Completion can probably be expected in late 2017. 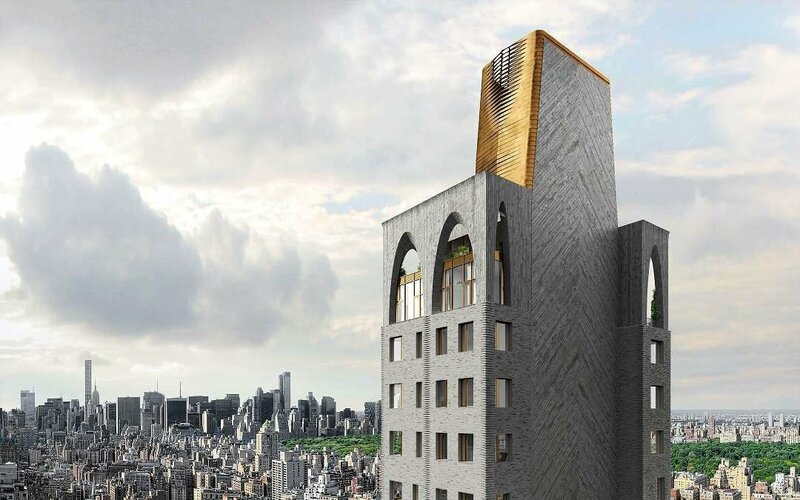 Foundation work is now underway on the 52-story, 141-unit mixed-use tower under development at 281 Fifth Avenue, located on the corner of West 30th Street in NoMad, report yimby.com. The latest building permits indicate the project will stand 728 feet in height and encompass 266,963 sqft. 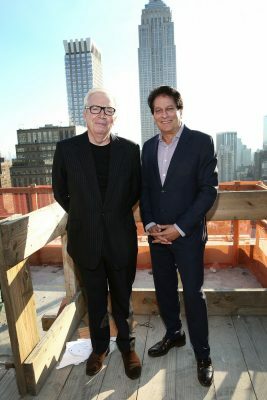 Construction is now underway on the 12th floor of Memorial Sloan Kettering Cancer Center’s 22-story, 750,000-sqft David H. Koch Center for Cancer Care facility at 530 East 74th Street. 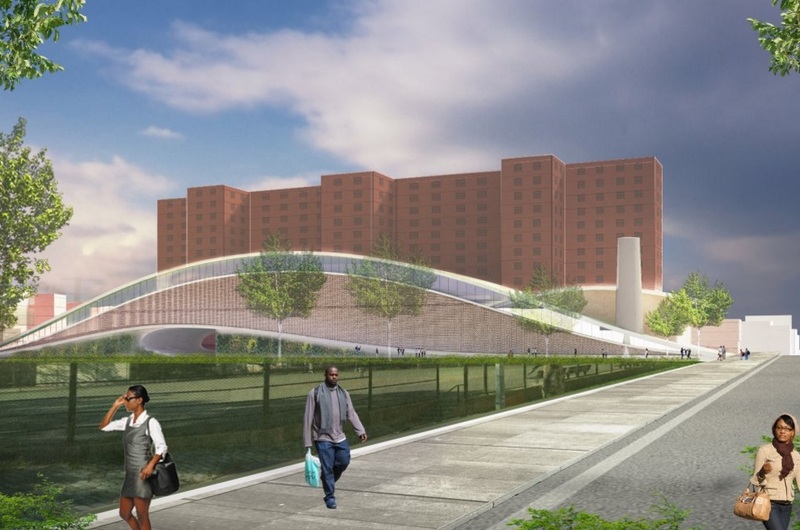 The building designed by Perkins Eastman is located on the corner of the FDR Drive on the Upper East Side, report yimby.com. Progress on the project can be seen thanks to photos posted to the YIMBY Forums. At 524 East 74th Street, work is ongoing on a 16-story, 403,000-sqft academic facility for the City University of New York and the Hunter College School of Nursing, designed by Ennead Architects. 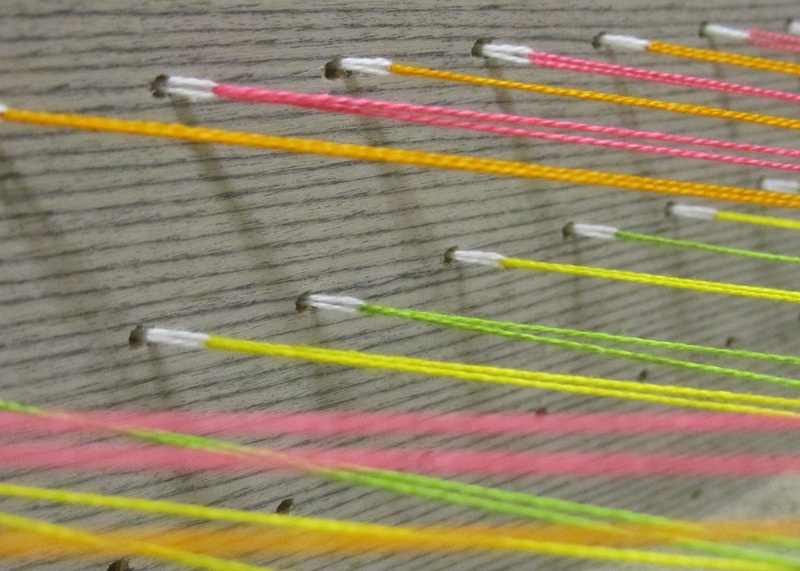 – SCHAUM/SCHIEH, led by Rosalyne Shieh and Troy Schaum. 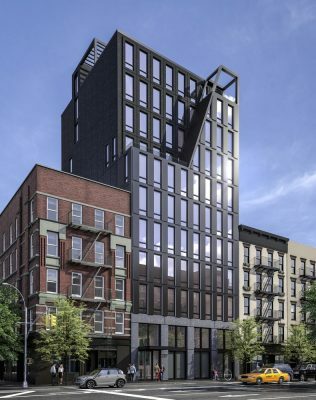 Development partners Hogg Holdings and Vinci Partners USA announce 28-unit residential condominium building has come to market on the Lower East Side of Manhattan. 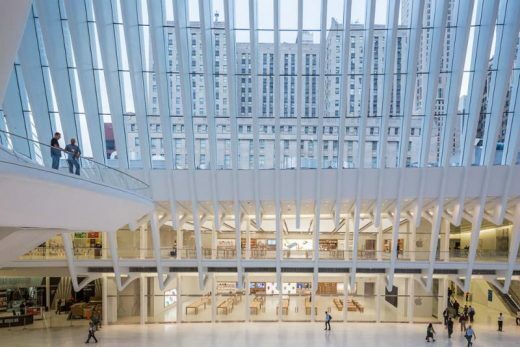 Apple’s newest Manhattan retail store opened in the recently completed World Trade Center Oculus. The new store is the only space to inhabit two levels and a full quarter of the light-filled structure. to academic support and technology in a safe environment. Viaje a Nueva York-I from Simon Garcia · arqfoto on Vimeo. Viaje a Nueva York-II from Simon Garcia · arqfoto on Vimeo. 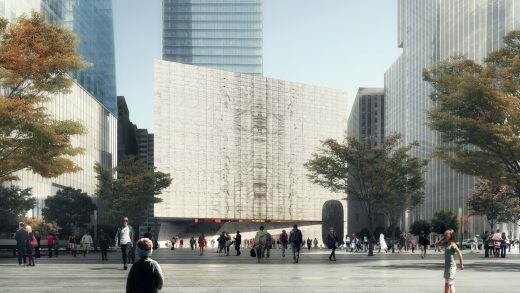 Ronald O. Perelman Performing Arts Center – new images of this major building design at the WTC site. 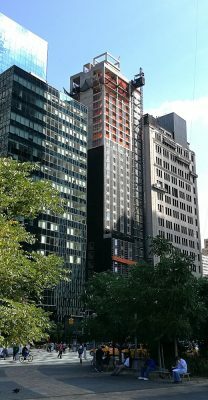 The 29-story, 250-key hotel under development at 6 Water Street — located at the corner of Moore Street in the Financial District — has topped out, reports newyorkyimby.com. 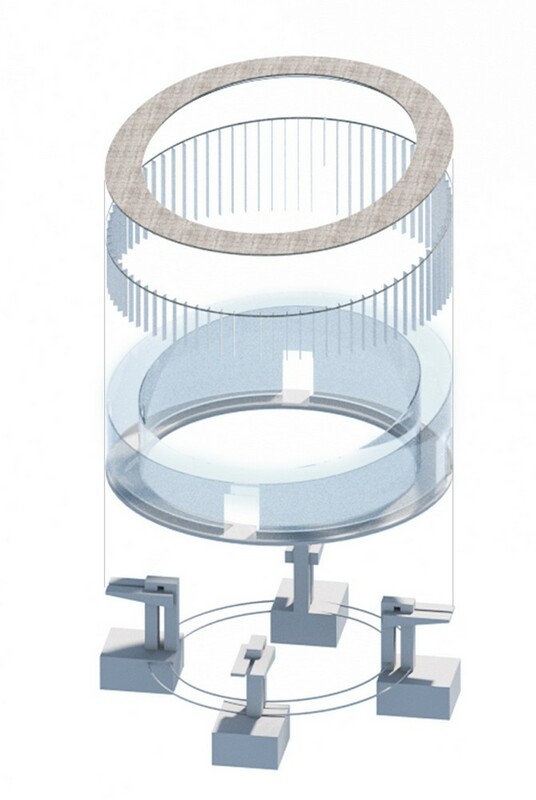 The design is by Gene Kaufman Architect PC, based in SoHo. 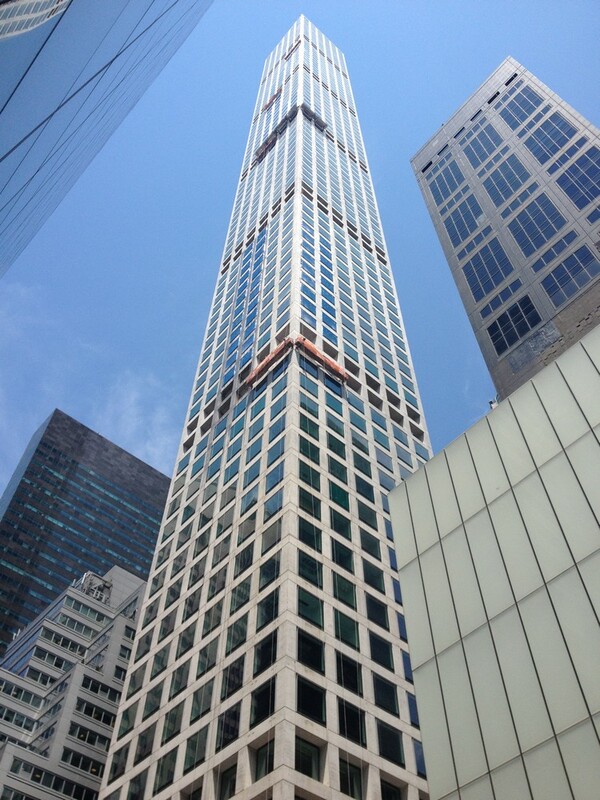 The latest building permits indicate the 298-foot-tall structure measures 125,684 sqft. Guest amenities at the hotel will include a fitness center, coffee shop, and a restaurant on the second floor. The hotel rooms start from the third floor. Magna Hospitality Group is the developer. This bold architecture design tries to create a ‘unique’ experience in this world-famous public park. The creators of the Lowline, a proposed park below Delancey Street on New York’s Lower East Side, have received a major show of support from the New York City Economic Development Corporation (NYCEDC), reports the Architectural Record. 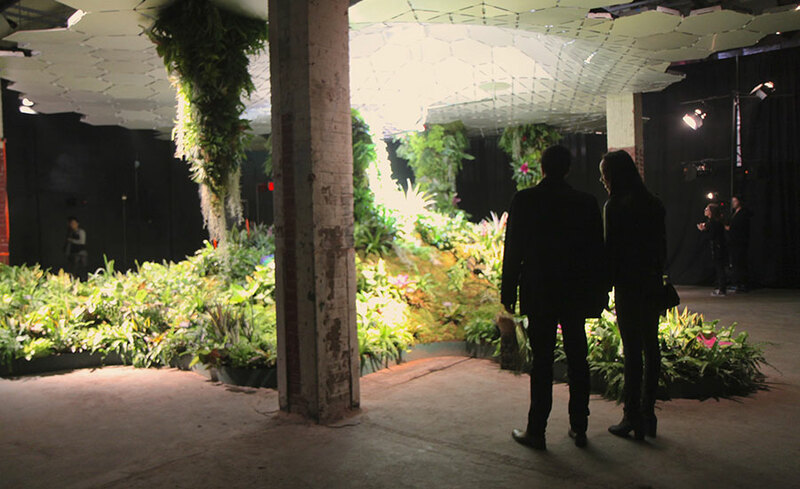 Lowline’s founders are James Ramsey and Dan Barasch. Last fall, the NYCEDC issued a request for expressions of interest (RFEI) for reusing an abandoned trolley terminal below Delancey Street. 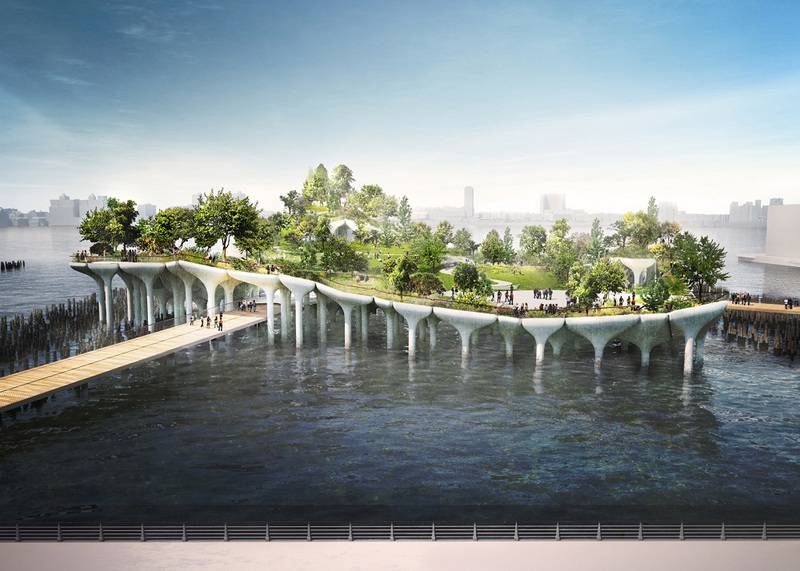 The RFEI elicited just one response, from the Lowline organization. On July 13th the NYCEDC gave the Lowline its “conditional designation” as lessor of the underground space. 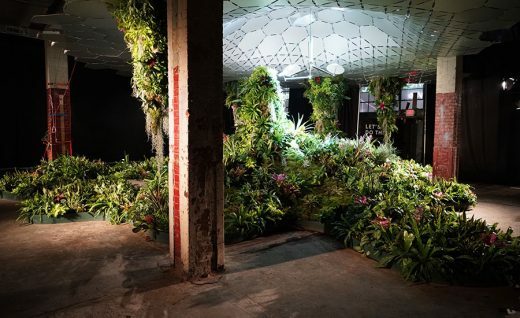 The Lowline’s founders, James Ramsey and Dan Barasch, first proposed the subterranean park in 2011, and they been experimenting with ways of carrying concentrated light through tubes in order to grow elaborate gardens in the terminal, which is owned by the city and has been abandoned for 80 years. 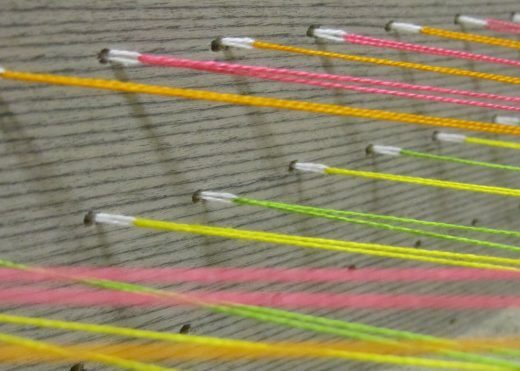 The winning project titled ‘Weaving the Courtyard’ opened in Long Island City in June. The design is a site-specific architectural intervention using the courtyard’s concrete walls to generate both sky and landscape. 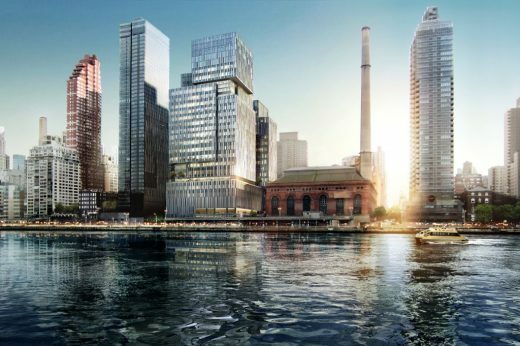 Designs for a new waterfront office development in Red Hook have been revealed. The mixed-use complex on a former industrial site seeks to build on the growing presence of technology companies in the borough. The development proposal includes more than 600,000 sqft (55,700 m2) of offices and 23,000 sqft (2,100 m2) of retail and restaurants. 828,000-sqft, black building at 39th Street and First Avenue. It’s the tallest in New York by architect Richard Meier and his first since his three apartment towers on West Street were completed more than 12 years ago. “The New York City Housing Authority—which with 178,000 apartments and more than 400,000 low-income residents is the city’s largest landlord—has committed to introduce solar panels on its roofs beginning in 2017. Thomas Heatherwick’s elevated park over the Hudson River next to Chelsea has been approved by planners. On a site that borders the East River and the Eleventh Street Basin in New York City, 556 designers looked to reinvent the aquarium. A totla of 178 architectural proposals were submitted. 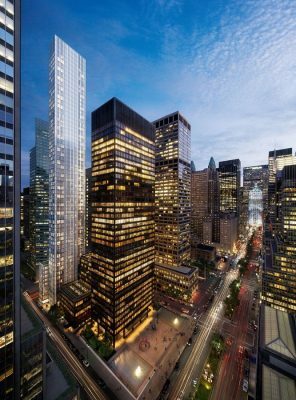 A 35-story mixed-use project in Manhattan’s Financial District can proceed, thanks to approval from the Landmarks Preservation. 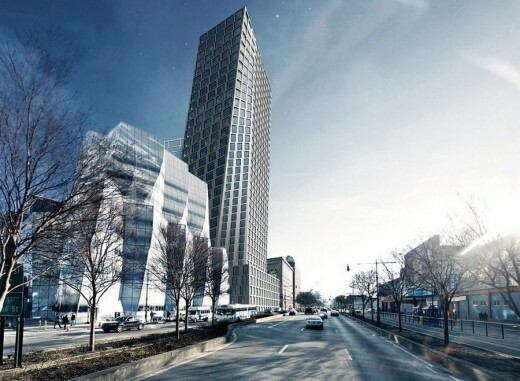 Proposal for the tallest tower building in Brooklyn. 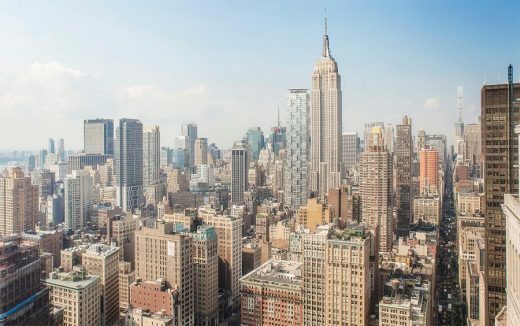 A Manhattan judge has struck down Bauhouse Group’s request for an injunction against Gamma Real Estate and its planned foreclosure auction of Bauhouse’s 3 Sutton Place condo project. 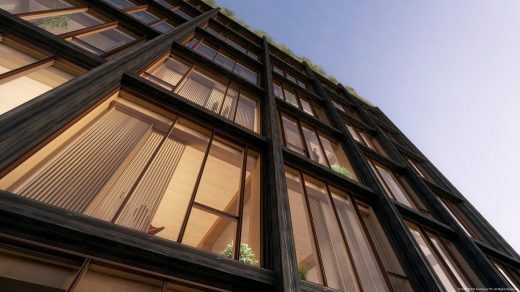 Located in Manhattan’s West Chelsea neighborhood, this ‘wooden’ ten-story residential condominium building has been designed immediately opposite the High Line. 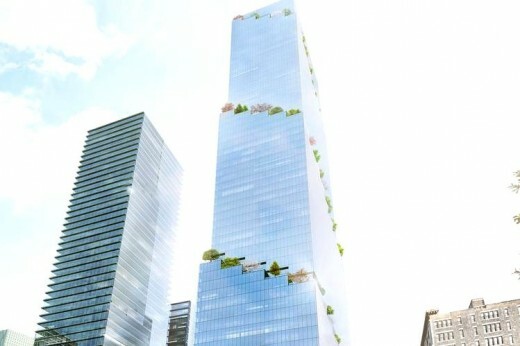 This pair of tower buildings will have 28 and 38 floors. This building is a 25-storey residential tower. 1407 Broadway, a premier building in Times Square South undergoing a dramatic transformation with extensive building renovations and an image repositioning, has launched a contest inviting designers to create the ideal work environment – with the winner receiving $14,000. A NYC architecture competition by The Lightstone Group, owners of the building, and its branding partner CO OP. Scott Resnick and Brown Harris Stevens are pleased to announce the opening of the sales office for 551W21, the new 19-story luxury condominium in West Chelsea by internationally renowned architect Foster + Partners. 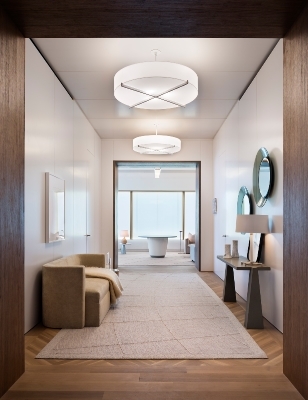 Designed by Lee Mindel of Shelton, Mindel & Associates, the sales office meticulously presents the signature interior elements of Foster + Partners’ building design. One World Trade Center’s Height Ratified at 1,776 Feet. The Council on Tall Buildings and Urban Habitat convened its Height Committee on November 8th in Chicago to evaluate its criteria for determining the official height of buildings, and to rule on the official height of One World Trade Center in New York. The Height Committee has reached a consensus that One World Trade Center’s height to its architectural top is 1,776 ft (541.3 m). 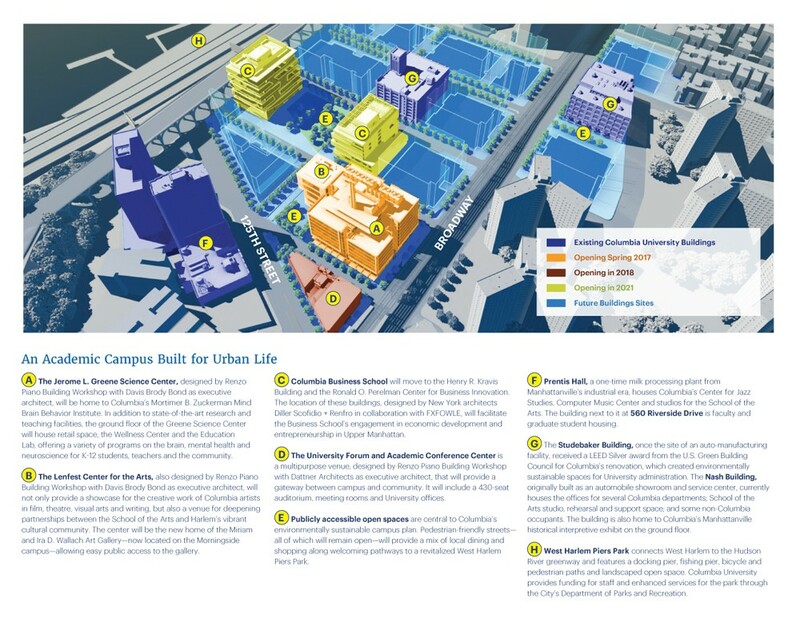 Masterplan for the extension of Columbia University in the Harlem district, on the north side of Manhattan. A project where architecture meets city-planning and sociology: this development reinvents the role of campus and opening its doors to the city. New photos + films of this new Downtown Manhattan building, located at an impressive site between the High Line and the Hudson River in New York City’s Meatpacking District. Renzo Piano Building Workshop in collaboration with New York City architecture office Cooper, Robertson & Partners, has developed the design over recent years. Dwell Media is proud to announce the winners of this year’s inaugural Dwell Vision Award, Amanda Schachter and Alexander Levi of SLO Architecture. 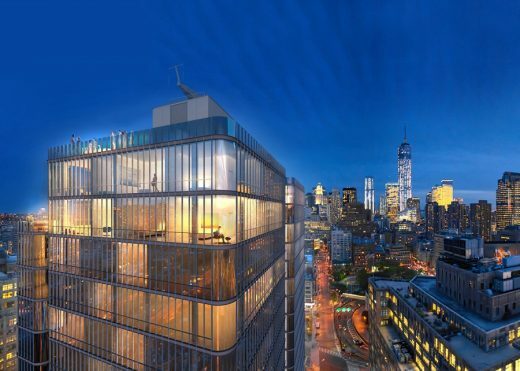 Scott Resnick has announced Foster + Partners as design architect of 551 West 21st Street – a modern, 19-story luxury condominium overlooking the Hudson River in West Chelsea. 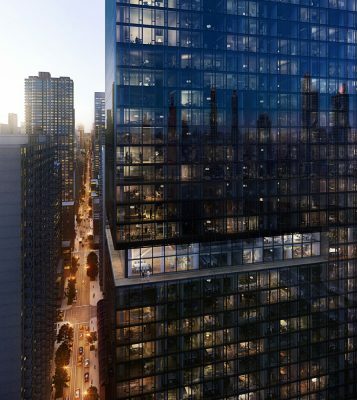 551 West 21st Street features 44 large-scaled residences, including three penthouses. The newly expanded Queens Museum was inaugurated by New York City Mayor Michael Bloomberg. Located in Flushing Meadows Corona Park, the building renovation doubles the size of the institution, adding 50,000 sqft of new galleries, classrooms, public event spaces, a café and a museum shop. 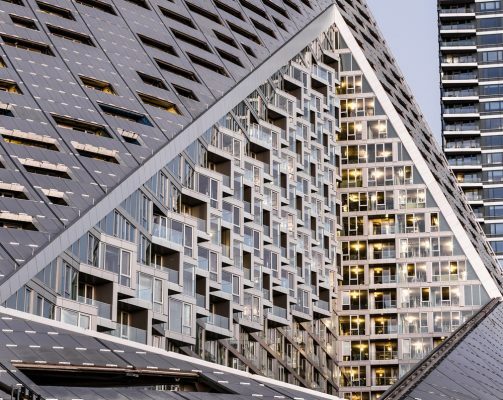 Steven Holl Architects’ project at Columbia University has been named the Best New Building in New York in the 2013 MASterworks Awards, administered by the Municipal Arts Society. The MASterworks Awards celebrate excellence in architecture and urban design in New York City, recognizing the best projects that have made significant contributions to the built environment of the city. Builidng have to have been completed in the last year. This new interior occupies half of the sixth floor of the New Yorker Hotel in midtown Manhattan. The project is part of EHS’s move to replace small and isolated satellite cooking facilities and lounges embedded among dorm floors with large, vibrant, multi-faceted spaces complete with cooking, dining, library, recreation, film screening areas, and more. HWKN was commissioned to reinterpret a section of Exodus, for “UNSCROLLED: 54 Writers and Artists Wrestle with the Torah” edited by Roger Bennett. A stunning venue with indoor and outdoor space located in/at a pavilion designed by SHoP Architects, Watermark is perched on the edge of the ultra-modern new double level Pier 15 adjacent to NYC’s historic South Street Seaport on the East River. 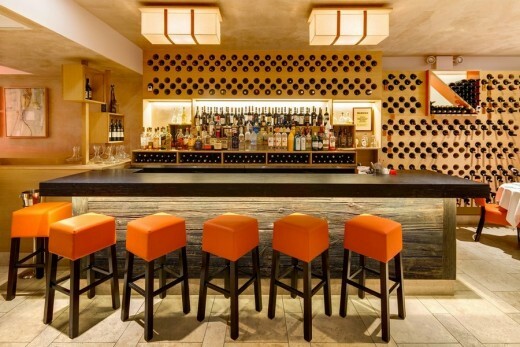 It aims to enhance appreciation of the waterfront through a sophisticated and stylish yet serene bar and lounge atmosphere with an unparalleled panorama of the New York Harbor and Brooklyn, Manhattan, and Williamsburg Bridges. The U. S. Green Building Congress has awarded LEED® Silver Certification for New Construction to Barclays Center, the first professional sports and entertainment venue in the New York metro area to achieve this status for its sustainable design and construction methods. Barclays Center was recognized in five environmental categories, including: sustainable sites, water efficiency, energy and atmosphere, materials and resources, and indoor environmental quality, along with innovation and design. 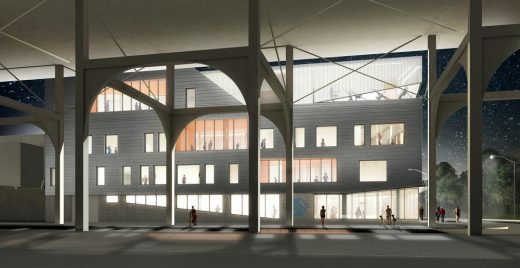 The City of New York unveiled its active design initiative and chose the University Center at The New School as the backdrop. 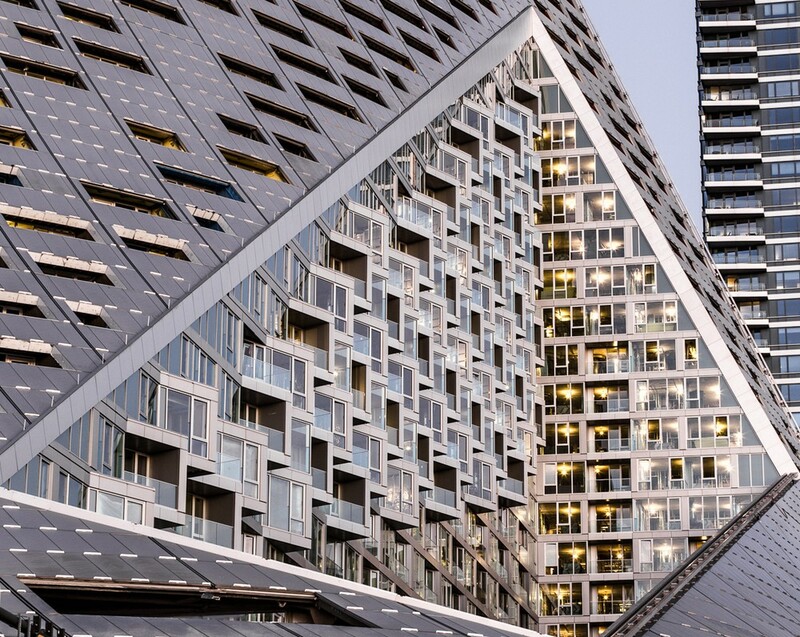 SOM’s design for the new building focuses on stairs rather than elevators as the principal means of vertical transportation, and the program is organized to encourage walking between destinations. The University Center at The New School will open in January 2014. 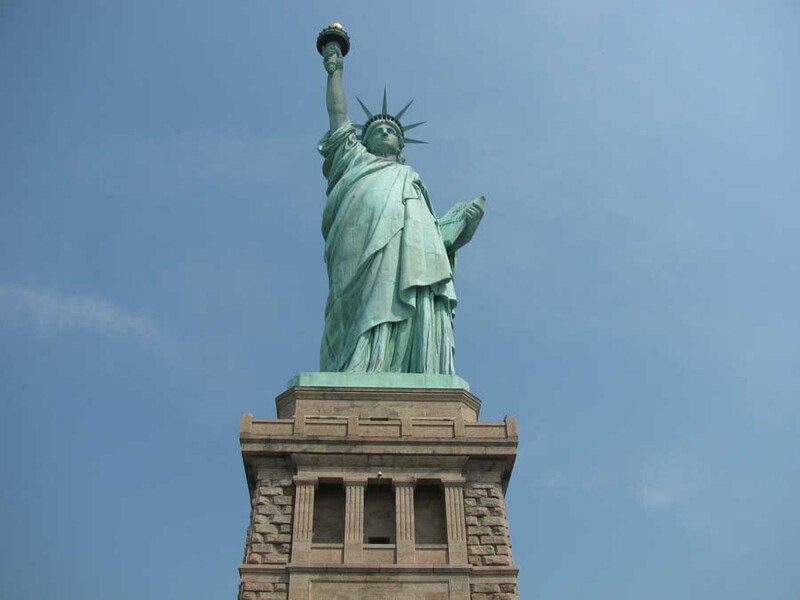 Over three months of extensive repairs, renovations and other post-Superstorm Sandy recovery efforts on Liberty Island have been completed. This work is being done on behalf of the National Park Service (NPS), and allowed the Statue of Liberty National Monument to reopen on July 4. The Monument receives more than 3.5 million visitors annually. Full repairs are scheduled to be completed by October 2013. Despite being one of four architects shortlisted for the 425 Park Avenue tower (Foster + Partners won) this would be the first in NYC for one of the world’s most famous designers. 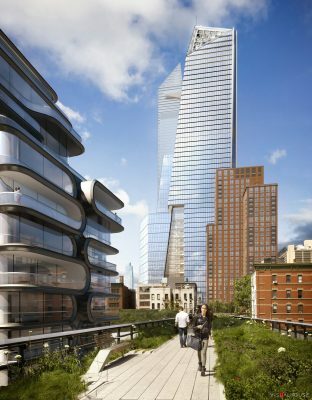 It is a boutique condominium adjacent to the High Line at 520 West 28th Street in Chelsea just south of Hudson Yards. Hurricane Sandy was a wake-up call for New York City. Global warming harbingers a future of rising seas and energetic storms against which we have no choice but to protect ourselves. The means will include both soft solutions – swales and wetlands, porous paving, green roofs and oyster beds – and hard – dikes, levees, walls, and flood gates. This proposal for a habitable levee falls on the hard side. In collaboration with Fondazione Renzo Piano, Gagosian Gallery is pleased to present “Fragments,” an exhibition of more than thirty years of architectural projects by the Renzo Piano Building Workshop. The exhibition has been generously supported by the Stavro s Niarchos Foundation. The work of Campo Baeza is on exhibition at the American Academy of Arts and Letters in New York. The exhibition of the work of Campo Baeza to celebrate the awarding of the Arnold W. Brunner Memorial Prize in Architecture 2013 is currently on at the American Academy of Arts and Letters in New York. It is an exhibition that is very sui generis, it is an Exhibition in the air; it is an exhibition that is very Campo Baeza. Like a phoenix rising from the ashes, so goes the Pavilion. The Fire Island Pines Pavilion, destroyed in 2011 by a devastating fire, is now near completion, once again giving the Pines community a central hub for culture and nightlife. The reincarnation of the legendary dance club is designed by New York-based Hollwich Kushner (HWKN) and developed by Blesso Properties. 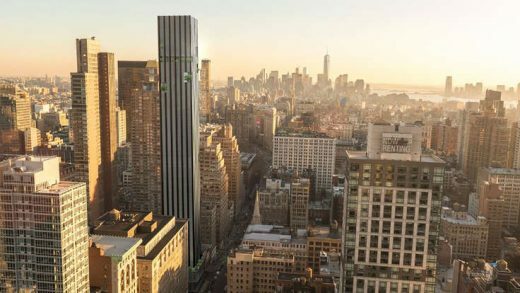 Expected completion for the 1,396-foot tower is set for 2015. 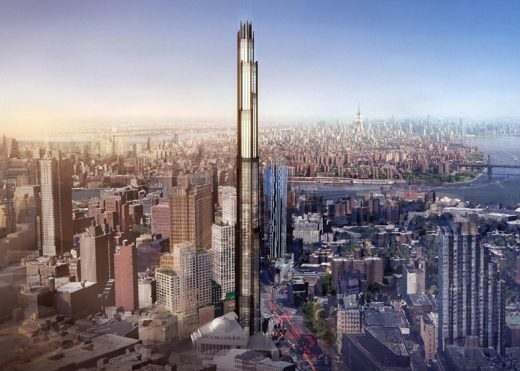 This skyscraper building will become the tallest building in New York City. 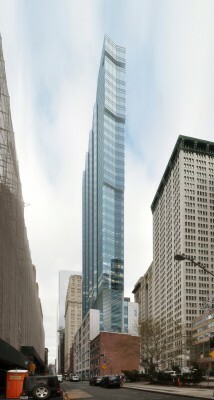 It would also become the tallest residential tower in the Western Hemisphere. The design of the Pop-Up Hotel focuses on the transformation of empty Class A office spaces into hospitality spaces. The setup is simple. We intend to partner with various owner/leasing agencies around Midtown to identify buildings in need of revitalization. A uniquely urban experience, the Pop-Up hotel will feature a variety of amenities and rooms catering to a wide diversity of clientele. 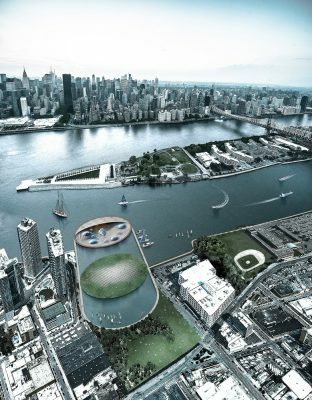 The project was a competition winning scheme in a design contest that was organized by the New Museum in NYC. It is an excellent example of a small project that can be the basis of a design/build competition, helps young architects and has enabled the museum to have a greater presence on the street and host a civic event. MoMA announced that Diller Scofidio & Renfro will provide a clear rationale for expansion to the west of its current site, which would subsume the former museum. 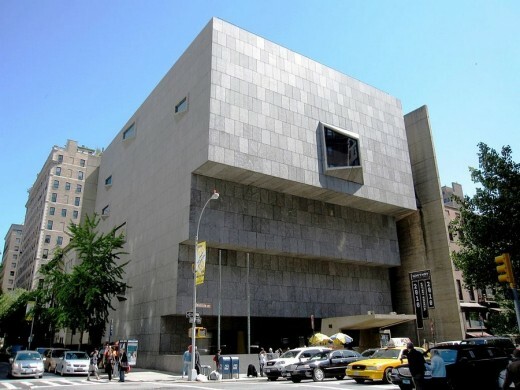 Today’s news is that MoMA has agreed to re-examine an earlier decision and “provide a clear rationale” for potentially tearing down the former American Folk Art Museum. If you wanted to summarize the path of the biological life and the part that Man has played in the History of the planet Earth, we could start from the first organic cell up to Usain Bolt. In a surprising way, we would not use more than 60 seconds, because evolution has followed very simple and accurate guidelines and rules. The Bougheries project seeks to harness and reveal the extraordinary elegance and energy of humanity with a series of structures that map and mirror the ergonomics of everyday movements and gestures – from sitting to standing, lounging to laughing. The MTA’s $94.5 m rehabilitation of the Bleecker Street Station complex, designed by Lee Harris Pomeroy Architects in a joint venture with Weidlinger Associates, structural engineers, introduces an uptown link between two major subway lines while returning one of the city’s oldest stations to its original glory. It also restores the landmarked IRT station’s 1904 Beaux-Arts finishes, which were designed by the noted architecture firm Heins & LaFarge.